Like many of the best things in life this project came about by accident. Scottish Guitarist David Allison was asked to write music for a series of DVDs of silent black and white documentaries held by the Scottish Screen Archive. One of them, the soundtrack for "St Kilda – Britain’s Loneliest Isle", ended up being reviewed as "a great musical score" by Empire Magazine. It made sense to pursue things further. "The St Kilda Tapes" project soon led to the creation of "The Island Tapes", premiered in January 2006 at Celtic Connections in Glasgow, featuring original live music to silent films recording life on St Kilda, Harris, Skye, Orkney and Shetland in the 1920s and 30s, plus a sixth film exploring Scottish emigration to North America. Here's a clip of the team performing "A New Way to a New World" at Celtic Connections 2007 in Glasgow. Alongside David for the premier was Scotland’s foremost classical guitarist Allan Neave, the Berlin-based fingerstyle maestro Ian Melrose and the superb Gaelic singer Alyth McCormack. Celtic Connections’ Colin Hynd made the project his “Director’s Choice” and the Sunday Herald picked it out as one of the ten shows you must see. BBC Four TV filmed a performance of the St Kilda film and the premiere sold out on the night. And the critics gave it the thumbs up too. Since then "The Island Tapes" has toured Germany, played at film festivals in Estonia and Inverness, as well as performances in the United States, France and across the UK. 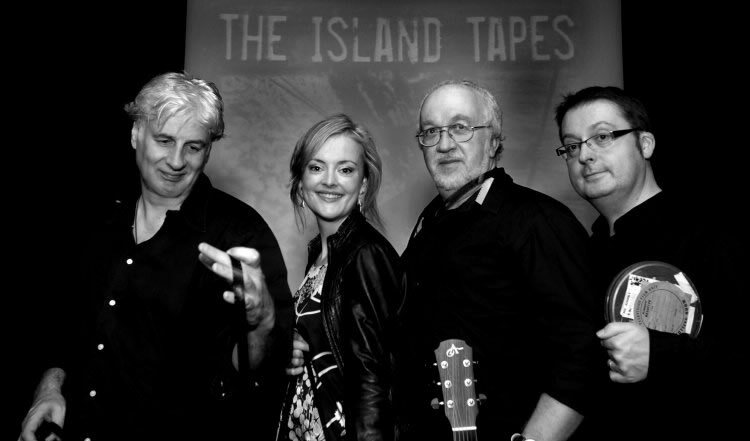 "The Island Tapes" with recorded soundtrack has played as a feature in cinemas including the Glasgow Film Theatre and the project became an acclaimed CD-DVD release. In 2010 gaelic singer Maeve Mackinnon joined the team taking over from Alyth McCormack. "A full 90-minute show of the highest quality, brilliantly executed by top-class performers." "David Allison's project, combining first-rate playing and singing with vintage film of Harris, Skye, Orkney, Shetland and St Kilda, made for an engaging evening."